Following the disaster of last week i'm going to make a new wooden panel for mounting the coin box. But whilst that is being arranged I have been starting to think about making a back lit marquee and screen bezel for the Vec-Cab. 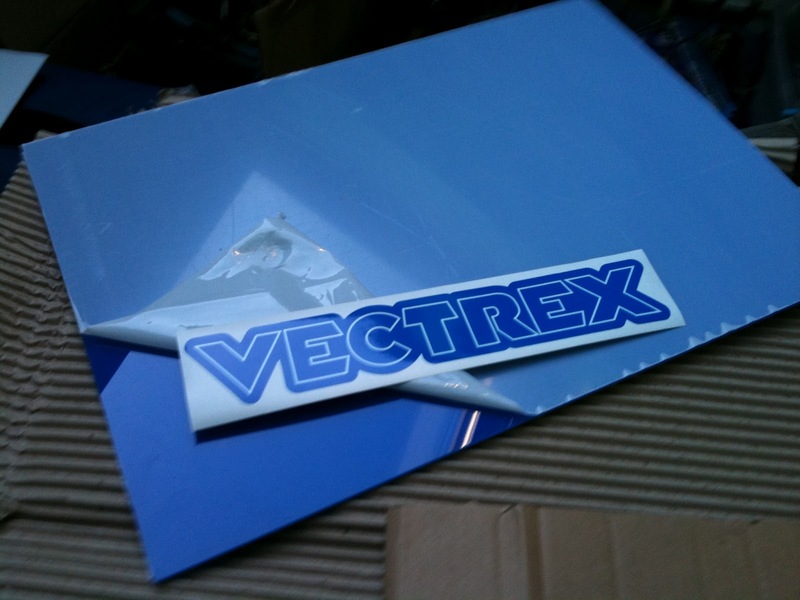 I'm going to use a translucent neon blue perspex as I feel this fits in well with the colours for the Euro Vectrex. Here'sa photo of a recent eBay purchase containing a perspex panel ((727 sheet, cast acrylic 3mm A3). I got this from The Wholesale POS CO they are a company and sell various bits on ebay. 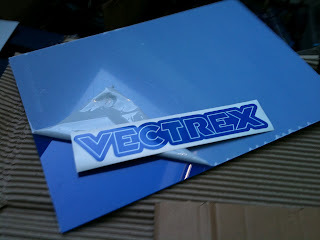 Also shown is another eBay purchase: a Vectrex sticker. I got this from ebayer bigange83 . In hindsight, the sticker is not exactly what I wanted. So I'm going to purchase a similar sticker but with larger letters and coloured black. Next thing is to work out how to cut the perspex and get a nice finish. Fine hack saw to cut it, then use a product called "Xerapol" to polish out the roughness. I've found you can also use routers on perspex without fear, and the Xerapol finishes it up nicely. Don't use a jig saw though. It's fast speed tends to melt the perspex and then it just re-joins behind the blade (only uglier). Thanks for the advice. I've just gone one better. I have a friend who works in a workshop and he has kindly agreed to cut it with a CNC machine!